A bit unseasonal this, since ‘musical surprises’ was the theme of my 2009 Advent Calendar. But I just couldn’t wait til next year to share my excitement at this one. It seems that not only is the theme of the “‘Friends” dance in Coppélia Act I not by Delibes (called “Thème Slave varié in the score) , but the Coppélia Czardas isn’t either. The Coppélia czardas – by Pugni? I discovered this looking through the microfilm of Pugni’s Théolinda, ou le Lutin de la Vallée (1860) [click this link if that one doesn’t work], a ballet by the choreographer and violinist Arthur St Léon. Look on page 29-30 of Act 1, and you’ll see great unmistakeable chunks of the Coppélia czardas, including so many stylistic particulars that it can only indicate that borrowing has taken place. My guess is both Delibes and Pugni were borrowing from a third source, introduced to them by St Léon, who was the person who had told Delibes that the ‘Thème Slave’ he’d heard on his travels was a folk song. The borrowing is so obvious, and so extraordinary, I can’t believe that I can be the first or only person to notice it. My hope is that sooner or later I’ll come across the original composer of this czardas, as others have done for the Hungarian dance No. 5 supposedly by Brahms, but in fact by Kéler. I originally wrote this post using the correct Hungarian spelling csárdás, but I’ve changed it to czardas more or less throughout. This spelling is more common, even though it’s wrong and archaic, partly as a result of it being spelled like that in the score of Coppélia, and in the famous Czardas by Monti. I’ve retained the wrong spelling to make it easier for search engines to pick up this post. This entry was posted in Advent calendar, Dance, Music and tagged Coppélia, Delibes, Music, advent 2009, ballet, ballet accompaniment, csárdás, czardasz, musical surprises, pugni on July 12, 2010 1:33 pm by Jonathan Still. 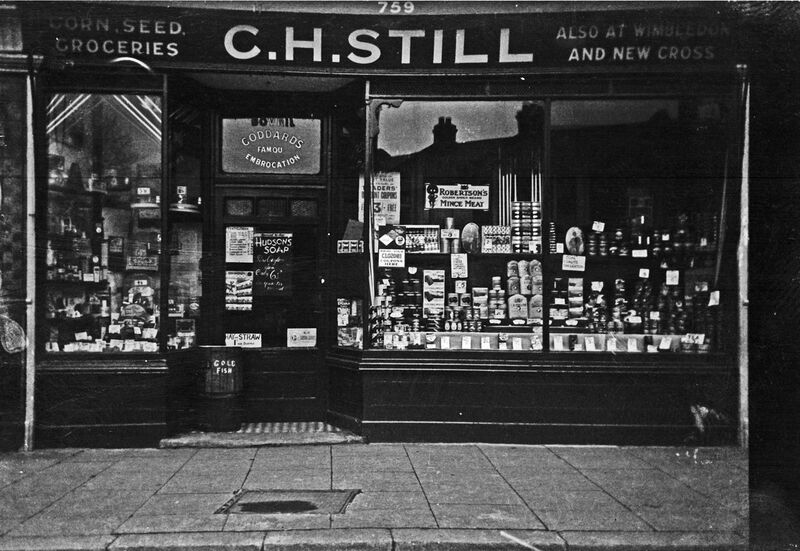 My grandfather's shop in Garratt Lane, late 1930s, I think. Happy Christmas! Today’s revelation is not strictly a musical surprise, except that it vaguely concerns me and I’m a musician. But it’s quite surprising all the same, and I love it. I came across this old photograph of my paternal grandfather’s cornchandler’s shop at 759 Garratt Lane a couple of years ago. The site doesn’t exist anymore as it was bombed in the blitz, but I believe it was at the junction with Franche Court Road, opposite Summerstown. Isn’t it slightly weird that after being born in Bournemouth, moving to London, and over 20 years of adult life, working my way down a succession of residences on the Northern line, I should end up where I live now, which – entirely by chance and without knowing about it – is only a few minutes walk from where my grandfather had a shop? If there’s a point it’s this: this Advent Calendar has often been about pointing out the realities behind abstractions, ideals and false unities in music. So it’s rather appropriate that I point out the realities behind the author of these posts. I rather like the idea that this blog, however metaphysical at times, is just the ramblings, from Tooting, of the grandson of a Tooting grocer. This entry was posted in Advent calendar, Music, Personal and tagged London, Personal, Tooting, advent 2009 on December 25, 2009 4:49 am by Jonathan Still. I love Bartók’s Rumanian Dances, and indeed, I’ve just recorded them with the violinist Gillon Cameron on the album After Class 2. But I was gobsmacked when I heard my favourite band, the Romanian Taraf de Haïdouks playing them as they might have been before they got turned into 20th century concert repertoire, or ‘re-gypsifying’ them as it’s called elsewhere. Enjoy.If you’re a speed junkie, the best bits are from 6’35” onwards. This entry was posted in Advent calendar, Dance, Music and tagged advent 2009 on December 24, 2009 12:01 am by Jonathan Still. Vauxhall Gardens Estate. The name lives on, if not the splendour. Although the light and popular dance rhythms of Johann Strauss II seem a sociocultural world away from the ‘classical’ Tchaikovsky, they’re not. It’s our own snobbery that obscures the connections in the music, for what is Tchaikovsky most famous for if not the Waltz of the Flowers, and the waltzes from Sleeping Beauty and Swan Lake? But there is a physical and geographical connection too. For in 1865, Strauss – who was a regular guest conductor at summer concerts at the Pavlovsk station in Russia – conducted the first public performance of Tchaikovsky’s Characteristic Dances. At a station? Well yes. The station at Pavlovsk was no ordinary railway terminus – it had been fashioned on the magnificent Vauxhall Pleasure Gardens in London, and included a concert hall in formal gardens, amongst other Imperial extravagances. And it’s that connection with Vauxhall that, to this day, gave rise to the Russian word for ‘train station’ – vokzal. By the strangest of coincidences, I’m now off to Vauxhall to play for class for the Strauss Gala. And as someone has wittily pointed out since reading this post, Tchaikovsky would have been very at home in today’s Vauxhall, which is gayer than Old Compton Street. This entry was posted in Advent calendar, Dance, Music and tagged London, advent 2009, waltz on December 23, 2009 9:11 am by Jonathan Still. Standing on bridges makes me all spiritual and contemplative. A psychopompic moment if ever there was one. Next time you get to a slow bit of a ballet where there’s something a bit wafty and barcarole-ish in 6/8, look out for a psychopomp. A psychopomp, explains the scholar Rodney Edgecombe in a fascinating article ‘can be either a spiritual guide or a figure who conducts the soul from the zone of this life and the putative next.’ (2001, p.259). And to illustrate the point, he cites a host of examples from opera and ballet where barcaroles underscore or signify the transition between two worlds, including the opening tableau of La Sylphide (1832), the ballabile of the Wilis in Act II of Giselle (1841), the beginning of the ‘Kingdom of the Shades’ from La Bayadère (1877), the ‘Panorama’ in Act II of Sleeping Beauty (1890) and the opening of Act II of The Nutcracker (1892). You can add several others to this list, including the ‘Rose Adage’ from Sleeping Beauty, ‘Prayer’ from Coppélia, the ‘White Swan’ pas de deux from Act II of Swan Lake, to name but a few. So when Drosselmeyer takes Clara to the Kingdom of Sweets at the beginning of Act II of The Nutcracker, it’s not chance that the music is a barcarole, and it’s not chance that we sense we’re going on a journey. It’s part of a web of references in music that have a textual significance for us, even if we don’t recognise it consciously. What I love about articles like this, and books like Raymond Monelle’s (see yesterday’s post) is that they tease out the text beneath ostensibly ‘absolute’ music, and uncover a much more interesting world. Bits of this post were first published in the Dance Gazette a few years ago. I’m not lazy, it’s just that I still find it interesting. This entry was posted in Advent calendar, Dance, Music and tagged Music, advent 2009, ballet, ballet accompaniment on December 22, 2009 7:43 am by Jonathan Still. Thanks to the musical semiotician Raymond Monelle and his wonderful book The Sense of Music, I am happily aware that there is a concept in music of a horse which is unique to music – it’s not a representation of a horse, but a musical idea, a musical topic. Hear a certain kind of 6/8, and you think ‘horse’. It’s not really horsey, of course. There is an important distinction between the sound of real horses in music (like in The Surrey with the Fringe on Top or Horsey Horsey Don’t You Stop) and the cheval écrit or literary horse, noble horse, horse as musical text. The musical horse is usually noble and male (though dysphoric women on horses like the Valkyries are another topic), and gallops along in a certain kind of 6/8 which then becomes, of itself, a musical topic which you find littering the musical field of the 19th century. And it is quite definitely a 19th century topic, part of the Romantic landscape, so to speak. Anyway, Monelle devotes 22 pages of the book to the subject (pp. 45-67), and I can’t do justice to the extraordinary depth and detail of his work, so if you’re interested, get the book or read a section of it on Google books. Here was a person who had wrestled with precisely the same questions as I had, albeit for different reasons, and here, oddly enough, was more useful information about selecting music for dance classes than I have ever read anywhere else. I rushed to buy a related book by Monelle called The Musical Topic: Hunt, Military & Pastoral which goes into extraordinary detail about the those topics in music, and the social, cultural and historical context that gave rise to them. And to celebrate this bizarre connection between semiotics and picked-up gallops, if you look really closely in the DVD extras of the RAD Pre-Primary in Dance & Primary in Dance where musical co-producer Andrew Holdsworth & I are talking about the process of creating the music for that syllabus, you’ll see that I had placed a copy of The Musical Topic on the MIDI keyboard in the background. This entry was posted in Advent calendar, Dance, Music and tagged Music, advent 2009, ballet on December 21, 2009 9:33 am by Jonathan Still. That’s not the whole surprise, because it’s a fairly well-known fact that the big tune in the apotheosis of The Sleeping Beauty is an old French song, the pre-revolutionary national anthem, no less, from the 16th century called Vive Henri IV . This is echoed by the ballet music historian Marian Smith in Ballet and Opera in the Age of Giselle (p. 108). She points out that it was already a tradition in Paris to use this tune as an ‘air parlant’ in French ballets when scenarists wanted to convey the grandiose. One example is the ballet Acis et Galathée from 1805. (The air parlant was a device from 19th century French ballet where the tune of a well-known song would be used in a scene, so that the unsung words – which the audience would know – would convey the meaning of the action. The idea that there was a golden age when everyone understood mime is a fiction – it was aided along by devices like this). So there it is – a curiously French, and curiously anachronistic apotheosis to a late 19th century Russian ballet. I suppose it would be like going to the opera house in 2010 to see a defilé choreographed to Land of Hope and Glory — which in fact, does not seem so unlikely at all. This entry was posted in Advent calendar, Dance, Music, Personal and tagged Music, Personal, advent 2009, ballet on December 20, 2009 9:19 pm by Jonathan Still. When you think of Russian folk music, what do you hear in your head? Probably the sound of someone playing a tune on a balalaika with that heart-rending tremolo on each note, as in the beginning of the Youtube clip on the left. How much more Russian could you get? What other country could this sound possibly represent? One of the most characteristic and widely copied features of the Russian folk orchestra – its rendering of the song’s melody in the form of a sustained tremolo on one string…is in fact not a Russian manner of playing at all. According to Boiko [a musicologist] it was borrowed by Andreev from the Neapolitan mandolin orchestra. All this and more fascinating facts about Russian folk music are in Laura J. Olson’s fabulous book Performing Russia: Folk revival and Russian identity. The quote above is on page 17. And if you listen to the Youtube clip, you’ll hear one of the folk songs Stravinsky borrowed for Petrushka, sung by the Red Army Choir (see earlier post). This entry was posted in Advent calendar, Dance, Music, Personal and tagged Personal, advent 2009 on December 19, 2009 8:27 pm by Jonathan Still. But this simply isn’t true. The valse à cinq temps was developed in Paris in the 1840s, and was danced by the eponymous heroine in Catarina by Perrot to music by Cesare Pugni in 1846. It may not have been that popular in the ballroom, but it still appeared in American dance manuals in the 1880s. In ballet, perhaps the most famous one of all is the dance of the Golden Idol from La Baydère, an interpolation of a piece titled ‘Persian March’ from an 1874 ballet by Minkus called Le Papillon (follow the link to see the source for this information). There are about a dozen ‘five step’ waltzes listed among the music in the American Memory collection of the Library of Congress, and Tchaikovksy wrote another valse à cinq temps in his 18 pieces Op. 17 (it’s No. 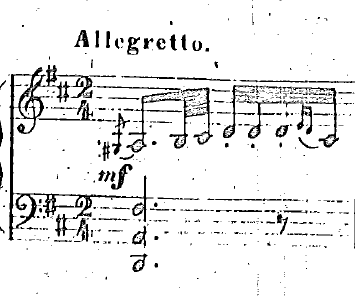 16), which is used by Cranko in his ballet Onegin. Not only that: 5/4 is common in Russian folk music (and English, if it comes to that), and there are examples in Tchaikovsky’s folk song collections. The promenade from Moussorgsky’s Pictures at an Exhibition from 1874 is also in 5/4. The ‘Fée Sapphir’ from The Sleeping Beauty is in 5/4, but this is a different kind of 5: at this speed, what’s really happening here is a variation in the length of the underlying pulse. The same thing happens in the 3rd of Alkan’s Air à cinq temps from Deuxième recueil d’impromptus. Published in 1849, this set also included a piece in 7. In several of these cases, you can see a dotted line between the ballroom, dancing masters, ballet, folk music, and the concert repertoire. Whether or not you think the 2nd movement of the 6th symphony is a valse à cinq temps or an evocation of Russian folk song doesn’t really matter – far from being the first time such a thing had occurred in Western music of the 19th century, the concept was already almost half a century old. And as for the idea that 5/4 has a ‘missing beat’, or ‘limps’, this seems like just one of many possible readings. Why not an extra beat? Or why not just the right number of beats because you decided to write in 5? Look at it this way, for example: by writing in 5, Tchaikovsky allows himself to start a scale passage on the 3rd degree of the scale, and end up on the tonic on a strong beat. What do you get? A perfect arc of a 6th as your first statement. How appropriate for a 6th symphony. This entry was posted in Advent calendar, Dance, Music and tagged Music, advent 2009, ballet, waltz on December 19, 2009 11:17 am by Jonathan Still. What to us is clearly a strathspey, with its jerky, dotted rhythms, might be called a reel. What to us is a reel, with a constant, even rhythm, is sometimes called a jig. In the eighteenth century in particular, the names for different types of dance music were interchangeable. The source for this is a page about the background to the James Scott Skinner collection at the University of Aberedeen. Take a look: it’s got digitized fiddler’s books and dance manuals, audio clips of Skinner playing, video clips of Scottish ballroom dances, links to other sites, and fascinating potted histories. Wonderful. This entry was posted in Advent calendar, Dance, Music and tagged advent 2009 on December 17, 2009 7:13 pm by Jonathan Still.